China’s entry into the modern age was not just traumatic but uproarious. As the Qing dynasty collapsed, joke books boomed. As warlords fought, writers competed to sling the funniest insult. “Humour” (youmo) became a household word. 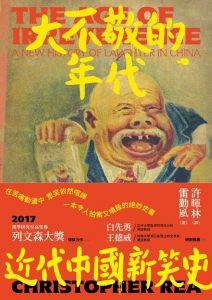 Come hear UBC professor Christopher Rea talk about how the first decades of the twentieth century transformed how Chinese people thought and talked about what’s funny, drawing from his award-winning book The Age of Irreverence: A New History of Laughter in China. This event will be conducted in Mandarin and English. Copies of both the Chinese and English editions of The Age of Irreverence are now on sale at the UBC Bookstore. Dr. Chris Rea will also be giving the same talk on October 13th at the Vancouver Public Central Library. Click here for details.